A handful of Big Train players pose with assistant coach Zach Morris after the team picture. The scene in the pavilion of Shirley Povich Field on July 30 was similar to that of June 1. Players returned the jerseys they picked up to start the season, hugged, reminded each other to stay in touch, took pictures and parted ways as strangers-turned friends. After a rain-ridden playoff push, the Bethesda Big Train are the Cal Ripken Collegiate Baseball League’s champions for the third year in a row. This year, due to rain, they share that championship with the North Division’s Baltimore Redbirds. The 2018 Big Train were record-shattering. In addition to setting a new franchise record for most wins in the regular season (ending with a 34-6 record), the team set league-wide records for most walks drawn (238), most RBI (273), most runs scored (326), highest on-base percentage (.413) and highest win percentage (.850). Outfielder Justin Wylie (Arizona) set a team record for the highest batting average (.417), and two-way player Alec Burleson (East Carolina) became the first Big Train player since Hunter Renfroe (BT 2012) to hit double-digit home runs in the regular season, finishing with 10 homers. Burleson was named most-outstanding player for the LCS, sharing the title with Redbirds’ Carl Gindl. Rising freshman Carson Taylor (VA Tech) finished the season as the team’s leader in hits (49). Burleson finished leading the team in RBIs (44) and home runs (10), Tyler Villaroman (San Francisco) led the team in walks (29) and stolen bases (21) and Fox Semones led the team in hit-by-pitches (13). Three Big Train pitchers finished the season with ERAs below 1.00: Ryan Metz (0.00, VA Tech), Alec Burleson (0.34) and Elliot Zoellner (0.64, Maryland). Metz also led the team in saves with four. Carlos Lomeli (St. Mary's CA) led the team in strikeouts (37), and was one of three pitchers with four wins on the season – joining Metz and Chris Clarke (Southern California). 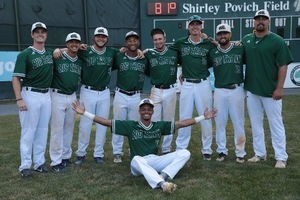 In the playoffs the Big Train went 3-1, sweeping the Silver Spring-Takoma Park Thunderbolts in the semifinals and going 1-1 against the Baltimore Redbirds in the finals, winnings game one at home and losing game two on the road. AJ Lee (Maryland) led the team in batting average (.429) through the playoffs. Wylie and Semones had a home run apiece, and five players – Jacob Westerman (San Francisco), Villaroman, Burleson, Semones and Jacob Southern (Jacksonville) led the team in hit-by-pitches with one apiece in the playoffs. Carson Taylor, Burleson and Lee each had six hits during the playoffs, and Taylor led the team in playoff RBIs (6). Wylie led the team in walks in the playoffs, with five. In the playoffs, Burleson and Lomeli recorded the lowest ERAs in the most innings pitched; Burleson pitched five full innings with a 1.80 ERA and Lomeli pitched six full innings with a 4.50 ERA. Lomeli also struck out the most batters in the playoffs, recording seven strikeouts. He was followed by Hunter Brown (Wayne State) and Burleson, who recorded six strikeouts apiece. Now, players have begun returning home for a few weeks’ rest before heading back to school. They leave Bethesda with new friends and connections, and a summer filled with memories.